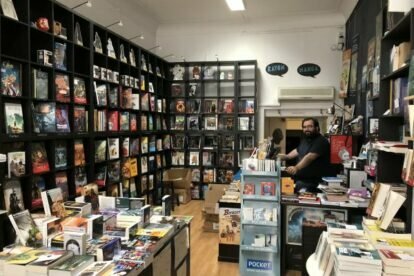 I decided to go in and found an amazing bookshop full of literature and comics related to fantasy and all kinds of fantastic stories: superpowers, science fiction, manga, humoristic books, children’s stories… anything of this type of publications is there. They also have small figures related mostly with movies (Star Trek, Star Wars…) and also with comic heroes such as Asterix, Gaston, and others. The place regularly hosts events, presentations and discussions about new publications, new releases and young artists. They even sell original framed comic art by local artists. Friendly and open, the man that runs the show is ready to discuss, give advice and show you what is new around. He has even printed some cards with a cartoon-like image of himself, which he attaches to his favorite reads so that you know he recommends them. I spent a very nice time there and count on coming back. It is definitely worth the visit.